1 : 1650000 Colton, G.W. 1 : 1254000 Hammond, C.S. 1 : 1600440 Colton, G.W. Schonberg's Map of Wisconsin and Part of Michigan. 1 : 1647360 Colton, G.W. 1 : 1340000 Tanner, Henry S.
AutoTrails Map, Wisconsin, Northern Illinois, Northern Michigan. 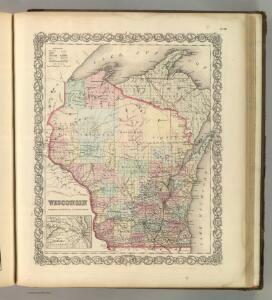 1 : 1900000 Tanner, Henry S.
Map of Wisconsin with drawings illustrating historic places and events throughout the state. The Great Seal of the State of Wisconsin appears at the top right and the flags of Spain (1600), France (1700), England (1794), and a U.S. flag (1805) appear at left. There is a key explaining all 104 drawings at the bottom of the map. Kishner, Mel Wisconsin Tales and Trails, Inc.
Pictorial map showing historical events and locations within the state of Wisconsin, as well as waterways and counties. Original caption on the bottom margin reads:"Published by the Milwaukee Sentinel commemorating its one hundredth anniversary June 27, 1937. Approved by the Wisconsin Conservation Commission. Checked and approved by Dr. Joseph Shafer, superintendent of the Historical Society of Wisconsin, and Dr. Louise Phelps Kellogg, senior research associate. Endorsed by the Wisconsin State Chamber of Commerce. Litho. in U.S.A." Bohlman, Nina S. Milwaukee Map Service Inc.
1 : 1520640 Snyder, Van Vechten & Co.
Map of the State of Wisconsin. 1 : 1140480 Snyder, Van Vechten & Co.
Map of Wisconsin showing congressional and judicial districts. Map of Wisconsin showing senatorial districts. Map of Wisconsin, showing assembly districts.